With the President of Croatia scheduled to speak at a OneCoin sponsored event today, now a warning from the country’s top financial regulator. As per their website, the Croatian National Bank is the highest financial regulator in the country. The stated goal of the bank is to ensure stability of Croatia’s financial system. On March 7th the Croatian National Bank issued a warning to consumers, advising them against OneCoin investment. OneCoin is not electronic money within the meaning of the Electronic Money Act, nor does it present a payment service within the meaning of the Payment System Act. The funds invested in this product are not covered by deposit insurance system and the individuals deciding on this type of investment fully bear the risk of loss of the funds invested. The bank goes on to cite additional regulatory warnings from “competent European Union countries”, including the UK, Belgium and Hungary. Bearing in mind the above-mentioned information, we advise citizens to exercise a high degree of caution when deciding on OneCoin product. As mentioned at the beginning of this article, Croatian President Kolinda Grabar-Kitarović is scheduled to speak at a Congress of South East European Women Entrepreneurs event today. OneCoin are the general sponsor of the event, with OneCoin logos expected to be plastered all over the venue for photo ops. OneCoin Founder Ruja Ignatova was to speak at the event as part of OneCoin’s sponsorship. Following an internal investigation into Ignatova’s credibility however, Congress organizers dropped Ignatova from the event. 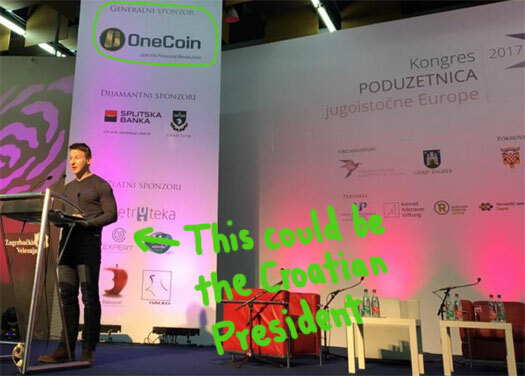 As indicated by a stage check yesterday, it is believed photos of Grabar-Kitarović standing infront of the OneCoin logo will be used to further promote the Ponzi scheme. Local time in Zagreb is almost midnight on March 7th. Kolinda Grabar-Kitarović will take to the stage at 9:50 am, March 8th. Whether Congress organizers will permit Grabar-Kitarović to stumble into a potential PR disaster for the Croatian Presidential Office remains to be seen. so, the Congress of South East European Women Entrepreneurs wants ruja’s money but not her presence? how embarrassing for the CSEEWE that they cannot find respectable sponsors for an event to be attended by the croatian president. on international women’s day the CSEEWE shouldn’t humiliate women worldwide by accepting ponzi funds to promote women’s causes. shame. Quick action though from Croatia. Kudos to all involved. We can always try to rescue some Romanians as well. As we announced, 2017 will be the year of MERCHANTS. And we noticed that something big is happening with the OneLife team in Romania. Romanians will be the first ones to attempt a massive 3 Day OneLife event combined with a first of its kind – Merchant Expo! One Life Presentation every hour…. The timing of this warning by the Croatian National Bank could not have been better. However, unfortunately I did not receive any response to my request to cancel the OneCoin sponsorship contract, which I sent to the organization of the event and office of the President of the Republic of Croatia last Monday 6 March. Unfortunately we did not receive a response to our well-intended warning. You have still 30 minutes left to take measures to prevent that the Croatian President will be pictured with the logo of the CRIMINAL OneCoin organization in the background. They attacked Croatian president Kitarovic for making a speech on event where is general sponsor company investigated by police. AntiMLM: They attacked Croatian president Kitarovic for making a speech on event where is general sponsor company investigated by police. maybe there will be a last minute cancellation by the president or the event organizers will take down onecoin logos? the president and organizers can hardly ignore both national bank and media warnings. The congress was mentioned at the Croatian national television 12 o’clock news and the fair organizer had to answer about Onecoin’s sponsorship. The logos have not been removed, but there was also no mention of the president Kitarovic. It was reported however that she visited the women working in a scientific institute earlier today. We’ll see if she was even there at the official opening. I found this announcement on NOLINK://predsjednica.hr/najave/9/9 (Google Translate). NOTE: All interested media representatives to the main entrance RBI came to 10.00 and that their arrival announcement on e-mail: info(at)irb.hr no later than 9.00 pm. So no mention of the Congress of South East European Women Entrepreneurs, where Mrs Grabar-Kitarović was on the agenda from 9:50 till 10:00. Both events are in Zagreb (the venues Zagreb Tower and Institute Library are only 2 kilometers apart) but if she has visited both events she was on a tight schedule. @garden Thx for this (relatively) good news. Dodatno smo ih pitali jesu li kao pokrovitelji osigurali novčana sredstva za kongres ili je dogovoreno samo pojavljivanje ministrice. Odgovorili su nam kako je pokroviteljstvo prihvaćeno bez osiguravanja financijske potpore. In addition, we asked them whether as sponsors provide funds for Congress or agreed only appearance minister. They answered us that the sponsorship accepted without providing financial support. I think it’s hard to believe that OneCoin sponsors without supplying money. then they should have no problem removing any mention of the onecoin scam. MikeR, this article revolves around the vice-president/minister Ms. Dalic. The question was directed to the Ministry of Ms. Dalic if they have provided any financial support for the congress (they haven’t). Indeed. That’s why I think it’s a blatant lie. But maybe (my interpretation of) the translation is not correct. garden: The president definitely wasn’t there. how very smart of the women’s congress to choose onecoin sponsorship over the presidents and vice presidents presence. maybe they had spent sponsorship funds and had no way to wiggle out by returning onecoin’s money? this was the Congress of South East European Women Entrepreneurs first event of this scale, the association was formed only last year. not a very good beginning! boo. Thx! My post #14 crossed with yours. So apparently my interpretation was wrong indeed. I thought it was info supplied by the organization. As far as I can tell, this is referring to the minister’s sponsorship, not OneCoin’s. anjali: how very smart of the women’s congress to choose onecoin sponsorship over the presidents and vice presidents presence. Not very bright at all. They’d have received far greater exposure/prestige and potential sponsorship on a larger scale from legitimate businesses, but they chose the short term gain of Ponzi funds! anon: As far as I can tell, this is referring to the minister’s sponsorship, not OneCoin’s. Yes thanks, now I understand. And I agree with you that the organization has made a wrong decision. This last-minute cancellation by their highest-ranked guests is a big blow for their prestige. Assuming nobody on the Congress is a OneCoin affiliate, I kind of feel sorry for them. Seems to be a worthwhile enough cause now caught up in accepting stolen Ponzi funds. Sort of tarnishes the organization going forward. The Bulgarian Association of Businesswomen could just as easily blame Bulgarian police for doing nothing since 2014. Time for Bulgarian authorities to grow a pair. I don’t think organizers expected to be under such media coverage until CNB made an announcement about Onecoin. Soon media followed and all hell broke lose. Responsibility is fully theirs for not removing questionable sponsor from the list and failing to do so even when National Bank released a warning. David Imonitie, a big MLM name, who was once persuaded to join Onecoin by the Steinkeller brothers, is no longer part of OneCoin/OneLife. Basically it means they paid him a good sum to join, and now he realized he joined a nest of vipers. Canadian Top Leader Daniel Grenon no longer part of OneCoin/OneLife. He was jailed in Tanzania during an event in Dec 16th 2016, and spent time in jail with many locals, him being the only white guy there..
That’s deffo a story worth covering, just need confirmation. He wasn’t in jail for days, but still enough so it was a scary experience for sure, and that was his last event. He has now stopped promoting OneCoin. 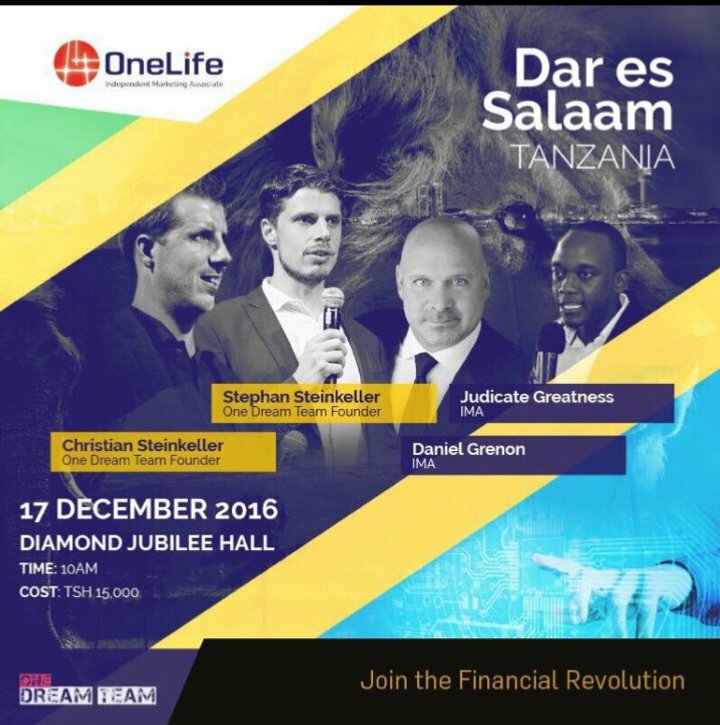 the event promotion shows that christian and stephan steinkeller, onecoin top affiliates, were also expected to attend. so were they arrested too, or they didn’t attend? @anjali – Steinkeller brothers did NOT show up at the event on December 17. A point of interest, however, is that if you recall, the shut down of Onecoin’s last remaining banks, Bank of Africa (Tanzania), under Frank Rickets wife’s name/ IMS had only just occurred about 3weeks prior to this event, and literally $10,000,000’s in Euro were both seized and frozen (presumably for later disbursement to victims of the scam). So, being that ponzi schemes don’t file petitions to extract such ill-gotten and money laundered gains, and being that Steinkellers are Tier 1 scammers in OneCon, they knew the heat which could potentially be surrounding this event! Remember, this isn’t their first ponzi rodeo. So, the Steinkellers NOT being there should come as no surprise. A Onecoinist at the event reported that both Daniel Grenon and Judicus Greatness (no, I’m not making up that name), a Tanzanian Top Leader, were both rounded up by several men dressed in plain clothes, handcuffed and driven off. …where the story goes from there would be interesting to hear straight from the proverbial horses mouth, although I was told that both later surfaced, but were said to have been held at least overnight in a Dar es Salaam jail, which would typically hold numerous (dozens) of inmates in a single cell under much less than tidy conditions. According to Tanzanian Penal Codes, a conviction for involvement in ponzi fraud carries a minimum 2-5 year mandatory sentence. Therefore, it couldn’t have been cheap for them to be let go, andhad they not, it would have been a Onecoin publicity nightmare, as Grenon, particularly, has been a pretty big name in MLM earners and OneCoin.